Oh my goodness, this is the last week we're featuring the gorgeous Sweet Peony Collection. Time is just flying by! However, next week we'll be debuting the absolutely beautiful Butterfly Dreams Collection and I'm so excited because I do love butterflies! The Sweet Peony is the star of today's card but the Classic Border dies do set the stage for it. Instructions: Cut a piece of white cardstock 6” x 12”. Score on the long side at 6”and fold card on the score line to create a 6” x 6” tent fold card. Using the decorative edge, diecut the bottom using the Classic Border Basics die. Sponge with dries clear adhesive and sprinkle with Rajni Chawla’s Crystal Clear. Dry using the Heat It Craft Tool. Cut a piece of the lighter pink designer paper 6” x 6”, ink the edges with Magenta Hue and adhere to the inside of the card using dries clear adhesive. Cut a piece of the darker pink designer paper 6” x 5” die cut the edge using the plain edge die and ink the edges with Magenta Hue. Cut a piece of the white cardstock 6” x 4 3/4” and die cut the edge using the scalloped edge die. Emboss the white paper using the rose embossing folder. Using the Bow-it-All 2, make a triple loop bow from pink ribbon. Cut a piece of ribbon to fit across the top of the embossed white layer. Be sure to cut it long enough so that it can be wrapped around the back and adhered there. Now adhere the layers together as shown using dries clear adhesive. Stamp the blossoms from the Rain Boots and Blossoms stamp set with Jet Black Archival Ink, color with the Zig markers and die cut using the coordinating dies. Add Nuvo Crystal white drops to the puff flowers and let dry. Spray with Sparkle Shimmer Spritz, sponge with dries clear adhesive and sprinkle with Crystal Clear. Stamp Small Peonies on Floral Oriental White cardstock with Magenta Hue ink. 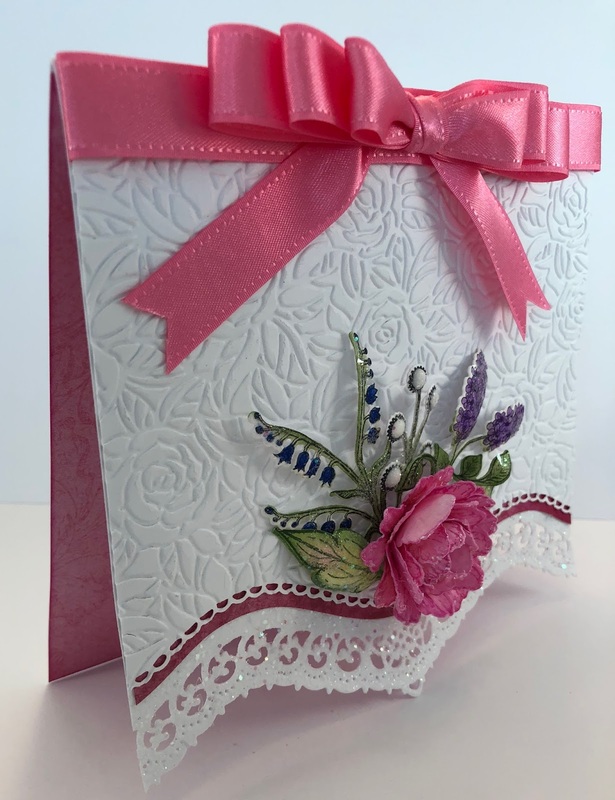 Color with Rose Madder and Magenta Hue ink, diecut using the coordinating dies, shape using the 3D Floral Basics Shaping Mold and finish the shaping with the Deluxe Flower Shaping Kit. Assemble the petals to create one medium flower. Stamp the Leaves from the Large Peony Stamp Set with Ranger Archival Olive ink, color with Leaf Green and Magenta Hue. Die cut using the coordinating die and add more Olive color around the edges. Add Minnie Pearls Prills to the flower center. Sponge the peony and the leaves with dries clear adhesive and sprinkle with Rajni Chawla’s Crystal Clear. 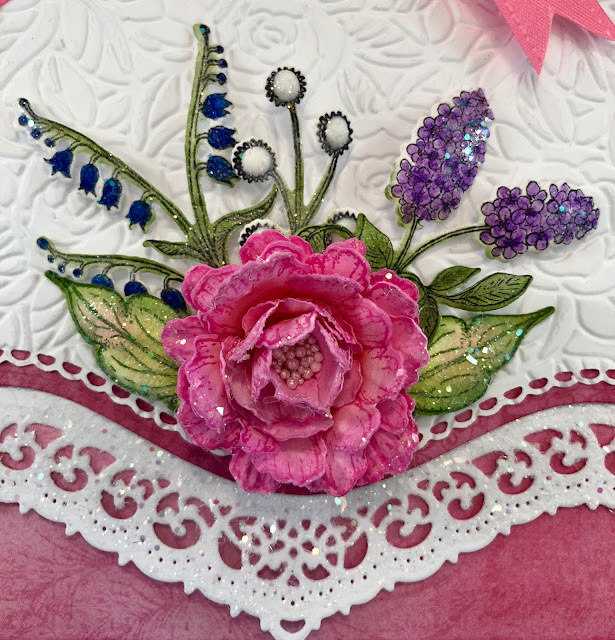 Adhere the bow, flower, leaves and blossoms to the card as shown using a hot glue gun. Thank you so much for stopping by...I so appreciate you!!! This is such an elegant card! 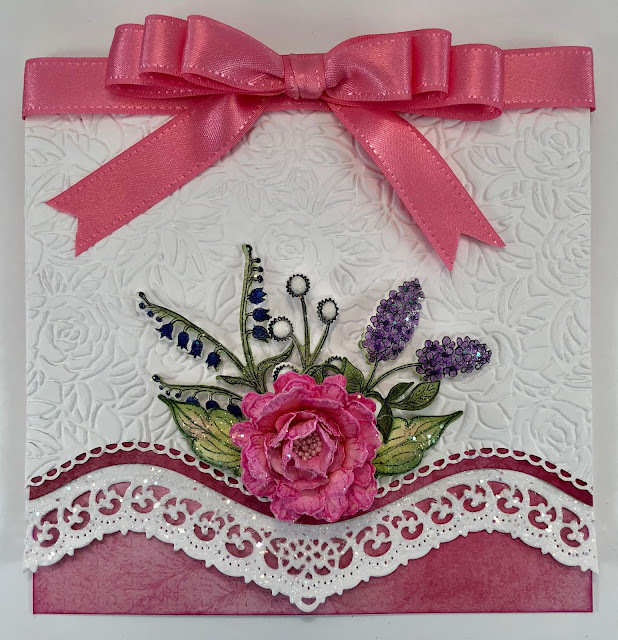 Love the embossing bordered with that lovely floral cluster and the lace border. So beautifully designed!! Well done! Thank you so much Martie for your beautiful comment! Wow this is such a beautiful card!!! Beautiful Janet!! Love your sweet bow and love the shape at the bottom!! Your flower is beautiful as well! You are so wonderfully inspirational! Thanks you for all that you do! Awww...thank you so much Cookie!